Two important skills in geometry — and real life — are finding the perimeter and calculating the area of shapes. A shape’s perimeter is a measurement of the length of its sides. You use perimeter for measuring the distance around the edges of a room, building, or circular pathway. A shape’s area is a measurement of how big it is inside. The long side of a rectangle is called the length, or l for short. The short side is called the width, or w for short. For example, in a rectangle whose sides are 5 and 4 feet long, l = 5 ft. and w = 4 ft.
As with a square, use s to represent the length of a rhombus’s side. But another key measurement for a rhombus is its height. The height of a rhombus (h for short) is the shortest distance from one side to the opposite side. Here, s = 4 cm and h = 2 cm. The top and bottom sides of a parallelogram are called its bases (b for short), and the remaining two sides are its sides (s). And as with rhombuses, another important measurement of a parallelogram is its height (h), the shortest distance between the bases. So the parallelogram here has these measurements: b = 6 in., s = 3 in., and h = 2 in. 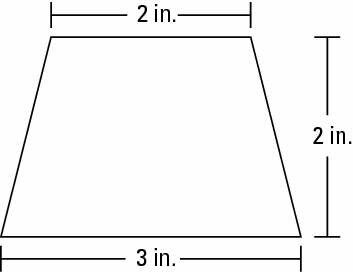 The parallel sides of a trapezoid are called its bases. Because these bases are different lengths, you can call them b1 and b2. The height (h) of a trapezoid is the shortest distance between the bases. Thus, the trapezoid here has these measurements: b1 = 2 in., b2 = 3 in., and h = 2 in. Because a trapezoid can have sides of four different lengths, you really don’t have a special formula for finding the perimeter of a trapezoid. 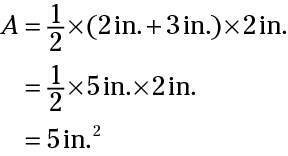 Just add up the lengths of its sides, and you get your answer.